. . at Poles Park. 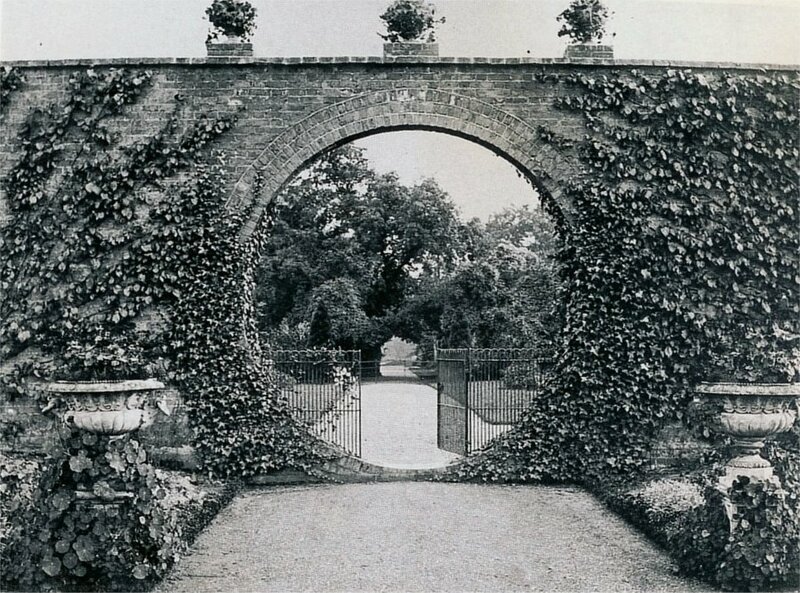 It is also known that he built a rose garden, because the Illustrated History of Hanbury Manor[i] included three old photographs of it taken c1872. Fig 1 is a general view of the rose garden, which shows the Conservatory in the right background. Although James 2 did not list the rose garden as part of his work at Poles Park, there can be little doubt as to its provenance, because it is so similar to those on other Pulham sites. 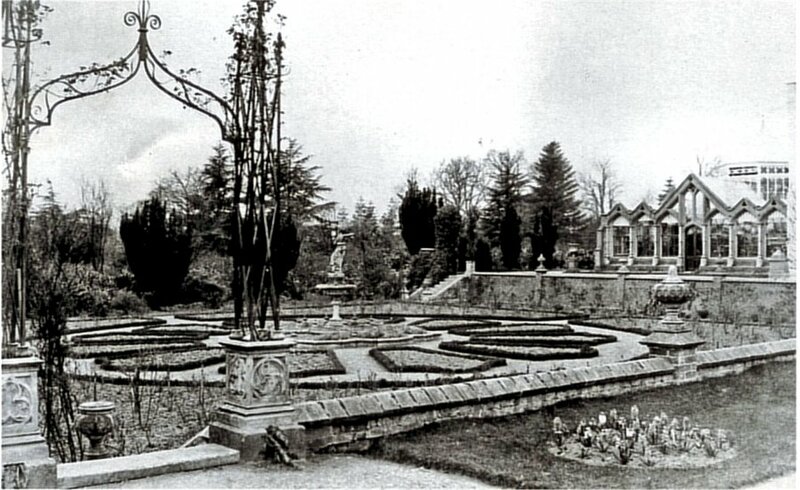 Rose gardens were one of the firm’s specialities, and the quatrefoil basin of the central fountain is typical of many constructed by the firm. 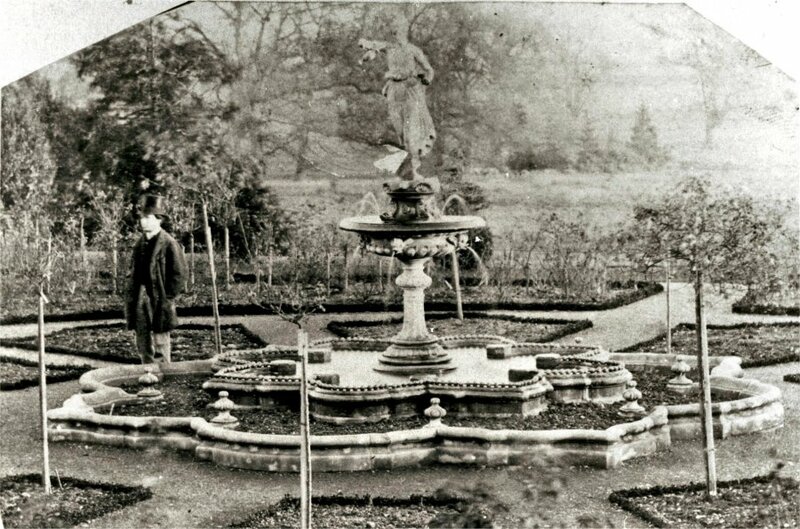 The fountain itself is also a figure of Hebe – cup-bearer and dispenser of the elixir of eternal youth to the gods – atop the fountain in Fig 2, which appears to be an exact part-size replica of James 2’s prize-winning fountain that was installed at Dunorlan Park, in Tunbridge Wells, Kent, just three years earlier, in 1862. 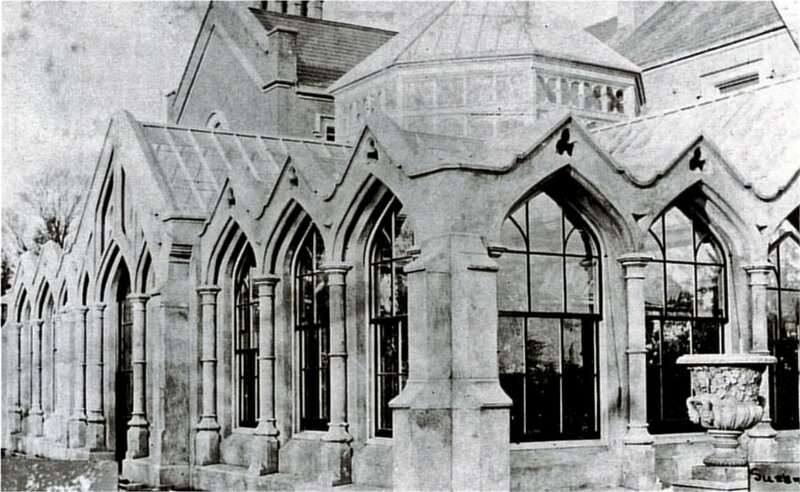 Fig 3 is a close-up picture of the conservatory visible in Fig 1, and this must be the one that James 2 mentions in his note. The sad thing is that the conservatory, rose garden, fountain, fernery and dropping well no longer exist. In fact, they didn’t last for very long at all, because, when Robert Hanbury died in 1884, after being pre-deceased by his son, the Poles estate passed to his grandson, Edmund Smith Hanbury, and his wife, Amy, who were then living at nearby Bedwell Park, in Essendon, Hertfordshire – discussed in ‘Site of the Month’ #4, Sept 11. They removed the conservatories on the terrace – widening it to make it ‘a very delightful feature’ – and replaced the rose garden with a lawn. They also built a Walled Garden, a picture of which is shown in Fig 4. The circular entrance was copied from an ornamental entrance in the Far East, and, although I have seen no similar examples of Pulhams’ work, one only had to look at the vases in front of – and on top of – the wall to make one think that James 2 must have worked here again at some time. This is likely to have been when Edmund and Amy decided to replace the old Poles House with a completely new one – the present Hanbury Manor that was completed in 1892. Along the garden side of the house were three large rooms – the dining room (now the drawing room), the drawing room (now the Zodiac Room), and the Library – designed so that, when their folding doors are open, there is a continuous vista of 120ft. The Zodiac Room is particularly striking, with an arched plaster ceiling that incorporates the twelve signs of the Zodiac. 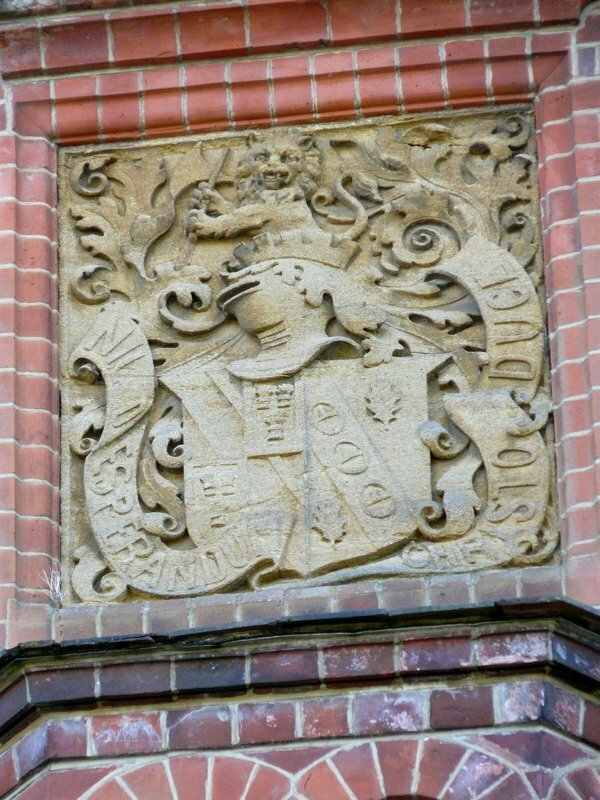 Another embellishment was a terracotta representation of the Hanbury coat of arms and motto – Nil Desperandum Christo Duce, or ‘Never despair with Christ as Leader’ – on a gable end at the front of the house, shown in Fig 5. There are other Coats of Arms similar to this at other sites where the Pulhams worked around this time – including Sandringham Royal Estate – and they are almost certainly the work of the Pulham craftsmen, so I also believe that the plaster ceiling-work is likely to have been by them. Edmund died in 1913, and Amy left to live in London until her death in 1925. The Manor was then sold and run as a convent school until 1986, after which it was completely refurbished as a luxury hotel, conference and golf centre, and opened for business as Hanbury Manor in August 1990. Financial problems within the owning group resulted in the acquisition of 26% of its shares by Whitbread PLC, and it now operates as the Marriott Hanbury Manor Hotel and Country Club. He led me to a quite overgrown section of undergrowth, buried deep in which was a rather odd-shaped object, the like of which I had never seen before, either. 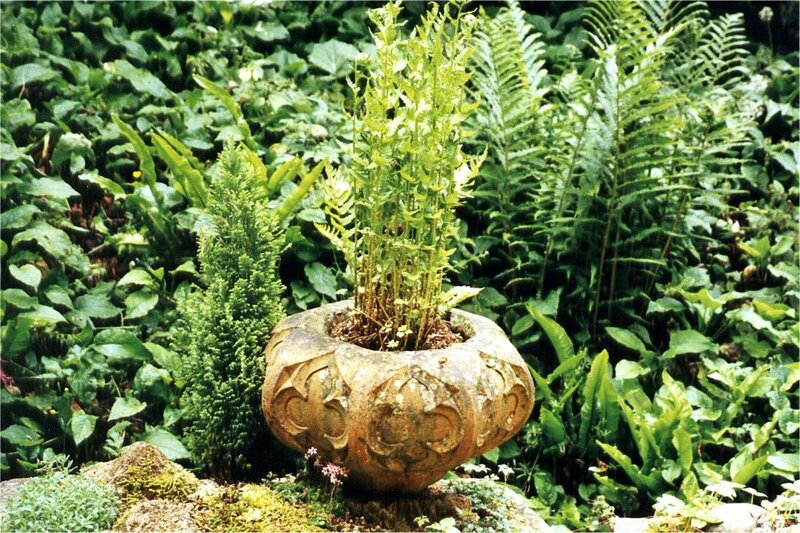 It was a rather ornate eight-sided terracotta bowl, so, knowing that the Pulhams had done some work on the estate, I decided to get it out from under the bushes, and take a picture of it – just in case. This is shown here as Fig 6, and there is certainly nothing like it in the Pulham Garden Ornament Catalogue. When we got back to the hotel, I was given a copy of the Hotel brochure from which most of the above historical notes were taken. It contained a lot of very interesting old archive pictures, including those reproduced here as Figs 1 to 4, and it didn’t take me long to realise that the long-lost article that we had unearthed can be seen sitting atop the pillars of the rose garden wall in Fig 1. The bowls have lids on in the picture, so I now know that this was part of an urn, made as a decoration for the Rose Garden photographed in 1872. I visited the garden again in 2010, and found something else that I was not shown on my previous visit. The first was the Walled Garden, which is still exactly as it was in 1888, and the second was something else in the ‘Secret Garden’. This is right next to the Walled Garden, although I didn’t realise it on my first visit, as we approached it from a different direction. A little way into this garden, the path splits into two – the right-hand path leading up the edge of a rather steep bank, and the left-hand one going around the bottom until they meet again at the other end. At the centre of the higher path, it crosses the start of a small gulley that runs straight down the bank towards a small pool in the centre at the bottom, and, just near here is a small grotto with a new seat recently installed in it. 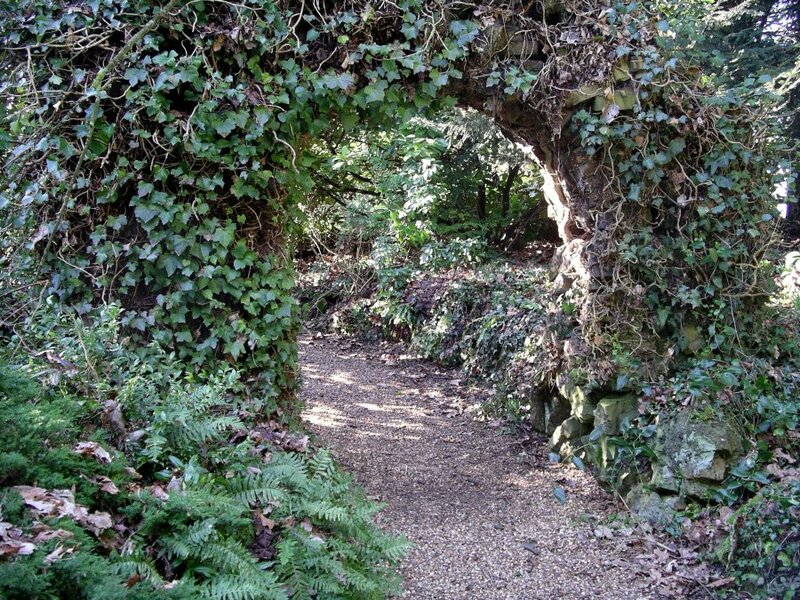 Moving down to the junction of the paths at the far end, one can return along the lower path, and the first thing one comes to is a foliage-covered arch, pictured in Fig 7 – there is another matching one towards the far end. One then comes to the pool, which is now railed off, but would have once been open, with a fountain in the centre. It is shown in Fig 8, looking back along the path, but, if one looks across it towards the bank, it is easy to imagine the water being pumped up to the top of the gulley at the top of the bank, and then cascading down over the rocks, and back into the pool at the bottom. 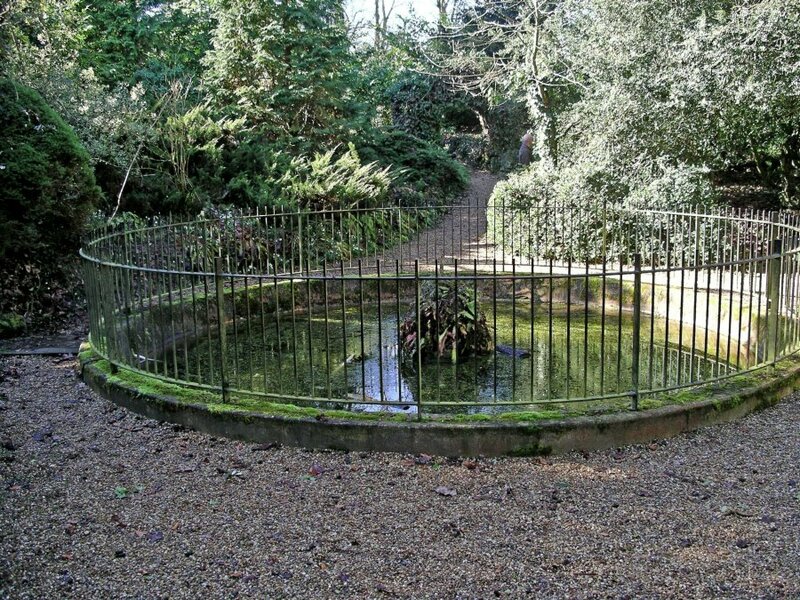 There is another grotto here – matching the one at the top of the bank – from where one could have sat and watched the fountain at play. 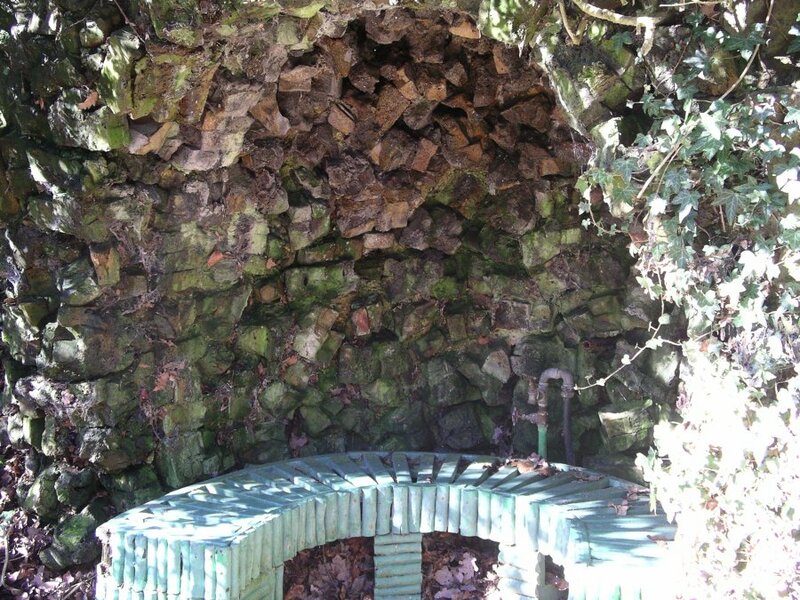 Fig 9 is of the lower grotto, complete with its new seat. One can only guess the dates when this work was done, but I suggest that James 2 first attended Poles Park in 1865 to construct the conservatory and rose garden, and then returned during the ‘restoration period’ c1892 to construct the Walled Garden and the Secret Garden. 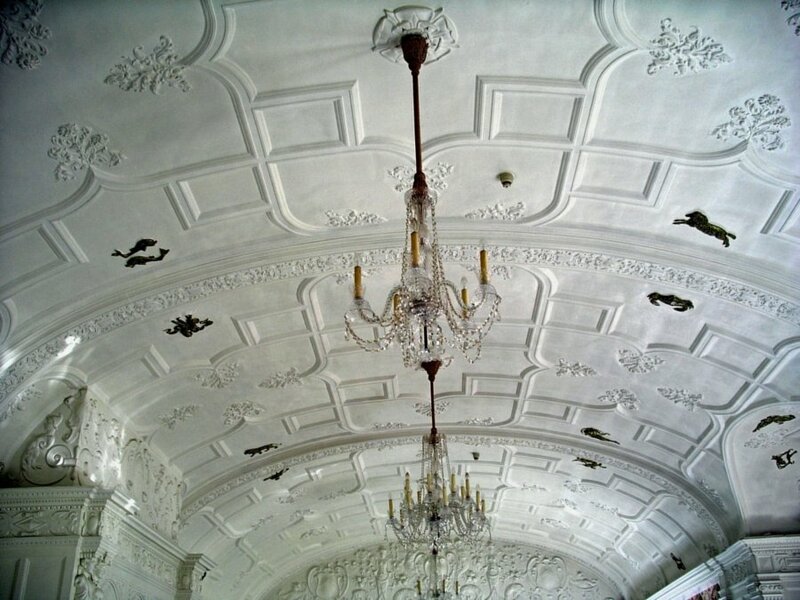 As noted above, I also have a feeling that they modelled the magnificent plaster ceiling in the Zodiac Room, although I shall never be able to prove it . . .
Posted on February 1, 2014 June 4, 2016 by Claude HitchingPosted in Sites Month 2Tagged conservatory, Edmund S Hanbury, Hanbury Coat of Arms, Hanbury Manor, Hebe Fountain, plaster ceiling, Poles Park, Robert Hanbury, rose garden, walled garden.